Are there really people living in New York City's underground systems? A video taken in Brooklyn last Thursday shows it's not so hard to hide out in the city -- as long as you know where to go. Jeunesse Awad was locked out of her apartment in Greenpoint last Thursday when she witnessed a man climbing into a subway grate. "Yesterday morning I locked myself out of my apartment and because Greenpoint and it was 6:00 am-nothing was open," Awad said. "So I walked around looking for coffee spots. We were passing each other on the sidewalk on Manhattan Avenue when he stopped at the subway grate and casually lifted it up." Awad was surprised by the situation and immediately whipped out her phone. "I had always had my doubts about the New York myth that people live in the subway [mole people], but he didn't look or act as I expected one would. He wasn't too tattered and seemed well aware of me," she said. 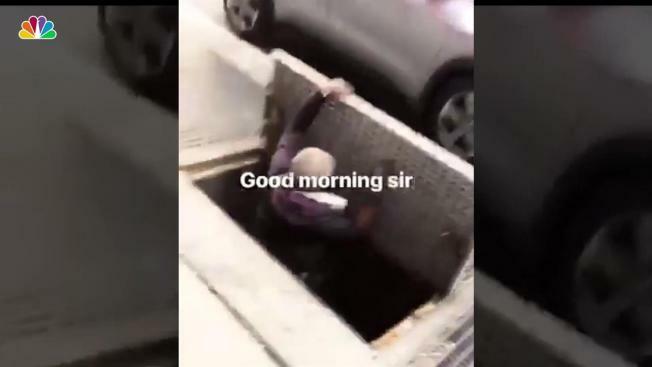 It isn't clear why the man was entering the subway grate that morning. "Him and I were the only ones up that early. We actually passed each other twice more that morning as I waited for my roommate to wake up. I hope I see him around again," Awad said.